Republicans have lost their invincibility in Nevada and Colorado in the wake of fast-moving demographic changes. Political change has been gestating longer in the new swing states of the Southwest than in the emerging battlegrounds of the Southeast. At the apex of their presidential strength, Republicans dominated the desert. From 1968 to 1988, the GOP presidential candidates swept Colorado, Nevada, and New Mexico all six times. Though New Mexico was sometimes competitive, the other two were not: over that six-election sequence, the GOP nominees averaged nearly 57 percent of the vote in Colorado and just over 59 percent in Nevada. But starting with Bill Clinton's first victory in 1992, Democratic fortunes in the region have improved--slowly at first, and then more rapidly. Although Republicans still hold the governorship and one chamber of the state legislature in New Mexico, the state has moved so sharply toward Democrats at the presidential level that neither side in 2012 treated it as a true swing state. Democrats have carried New Mexico in five of the past six presidential elections. And although it was achingly close in both 2000 and 2004 (the sole GOP victory), Obama won it by double-digit margins each time with preponderant support from its large Hispanic community. Democratic competitiveness revived more slowly in the other two states. Clinton's 1992 victories in Colorado and Nevada relied heavily on Ross Perot's quirky third-party candidacy splitting the vote (particularly among whites): even while winning, Clinton carried just 40 percent of the vote in the former and 37 percent in the latter. In 1996, with Perot running again, Clinton narrowly gave back Colorado and held Nevada by an even smaller margin, but in each state didn't crack more than about 44 percent of the vote. George W. Bush seemed to restore order for the GOP by carrying Colorado and Nevada in both of his races (while also, as noted, squeaking by in New Mexico in 2004). But even in his two victories, Bush never reached 52 percent of the vote in Colorado and even 51 percent in Nevada. That was a signal that the demographic and political forces changing those states' political dynamics had not abated. The trend was confirmed in 2008, when President Obama broke through to post decisive victories in both Colorado and Nevada. He carried both states again in 2012, but his repeat victories qualified the initial message: Obama's margin declined in each state, signaling that they had not yet become safely Democratic in presidential races. That message was underscored by the GOP's strong showing in both states in the 2014 mid-term elections. In Colorado, Republican Rep. Cory Gardner ousted Democratic Sen. Mark Udall, and the GOP nearly unseated Democratic Gov. John Hickenlooper while winning back one state legislative chamber. In Nevada, GOP Gov. Brian Sandoval won reelection with over 70 percent of the vote (and no serious Democratic opposition), and Republicans ousted a first-term Democratic Representative while also seizing both state house chambers. With its overheated housing market, Nevada fell farther during the financial crash than Colorado, which weathered the economic turbulence better than most states. But both states are now posting solid job growth, and like their Sunbelt swing state counterparts in the Southeast, each remains defined by dynamic expansion. From 2000 to 2013, Nevada ranked first among the states in population growth (increasing its numbers by nearly 40 percent) and Colorado sixth (growing by over 22 percent). For all of their positive signs in 2014, Republicans face a common challenge across both states in 2016 and beyond: a racially diversifying electorate that Democrats have proven more successful at mobilizing during presidential than mid-term elections. In Colorado, Democrats have also benefited from a growing population of socially liberal whites, particularly in its major metropolitan areas. But resistance that appears to be deepening among older, blue-collar and rural whites remains a formidable risk to Democrats in both places. Colorado: Significant diversity came later to Colorado than to the new swing states of the Southeast, but it is now advancing with accelerating force. In 1980, whites represented fully 89 percent of the state's eligible voters; that dropped to 82 percent by 2000, and 77 percent by 2012. The white share of the actual vote has not fallen quite as fast: from 92 percent in 1980 to 84 percent in Obama's reelection. The change has been driven mostly by the expanding Hispanic population--though mixed race, other, and Asians could play a growing role moving forward. From 1980 to 2012, Hispanics doubled their share of eligible voters from 8 to 16 percent. Over that same period, they also doubled their share of actual voters from 5 to 10 percent. African-Americans have remained stable: they represented just 2 percent of actual voters in both 1980 and 2012. The Asian, mixed race, and others category remains small today, at also just 3 percent of 2012 voters. Looking forward, the model expects minorities to play an increasing role. It forecasts that whites will drop from their 77 percent of eligible voters in 2012 to 74 percent in 2016 and 72 percent in 2020; by 2040 they are anticipated to fall to about three-fifths, and by 2060 to half. While African-Americans are projected to remain largely constant, the model forecasts Hispanics edging up to 17 percent of eligible voters in 2016 and then jumping more quickly to 19 percent in 2020 and 21 percent in 2024. For the Asian, mixed-race and other category the model likewise projects no change in 2016 (remaining at 4 percent) but then adding another percentage point in each of the following two elections. By 2040, it expects Hispanics to hit 28 percent of eligible voters, and the mixed race/Asian category to jump to 8 percent. 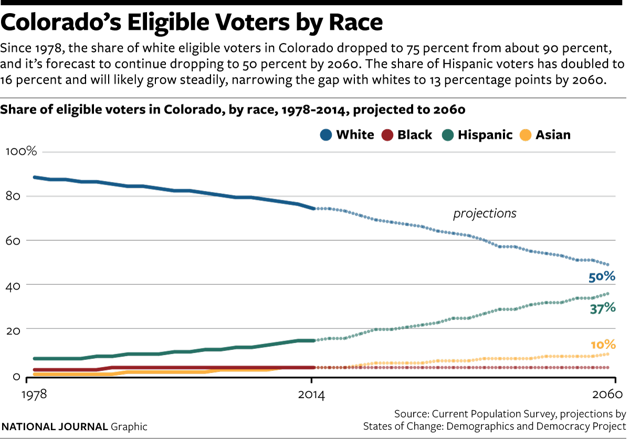 The exit polls show that over the past six elections, Democrats have consistently run well with Colorado Hispanics, never winning less than 61 percent of them (Obama attracted 75 percent in 2012.) They have also dominated among African-Americans. (The Asian, mixed race and other category has been too small to measure in exit polls.) In contrast to many states, the exit polls also show Democrats improving their performance among Colorado whites: their presidential nominees did not crack 40 percent among them from 1992-2000, but have won 42 percent, 50 percent and 44 percent over the past three races. Nevada: Racial change has been more propulsive here than in almost any other state. In 1980, whites were 89 percent of eligible and 90 percent of actual voters. By 2012, they had fallen to exactly two-thirds of actual voters and slightly less (65 percent) of the eligible. African-Americans grew modestly over that period (from 6 to 8 percent of eligible voters, and 6 to 9 percent of actual voters.) But the big change has been with both Hispanics (just three percent of actual voters in 1980 and 15 percent in 2012) and the grouping of Asians, mixed-race and others: they surged from a barely visible 1 percent of voters then to a solid 8 percent in Obama's reelection. With minorities already representing half of the state's eligible young adult voters (aged 18-29), the model projects rapid change to continue. It forecasts whites will fall to 61 percent of eligible voters in 2016 (a formidable four percentage point drop in one election cycle); 58 percent in 2020 and just 42 percent in 2040. While African-Americans will edge up to 10 percent of eligible voters over that long horizon, the model sees steady growth for Hispanics (from 17 percent of eligible voters in 2012 to 19 in 2016, 21 in 2020 and 32 in 2040) and the broader Asian/other grouping (from 9 percent in 2012 to 11 percent in 2016 and 16 percent in 2040). This change in the voter mix has reshaped the state's political balance more than any movement in voter preference. Since 1988, the total Democratic vote share among Nevada whites has varied only between 35 percent (in 1988) and 45 percent (in 2008). Republicans have carried whites in every presidential election over that period, except in 1992, when Bill Clinton and George W. Bush split them amid Ross Perot's third party candidacy. But Democrats are dominating among African-Americans (pushing their percentage from the mid-80s against George W. Bush past 90 percent under Obama) and have reopened wide leads among Hispanics. While George W. Bush won one-third of them in 2000 and nearly two-fifths in 2004, Obama has carried over 70 percent each time; he also ran very well with mixed race and other residents in 2008 (figures were not available for 2012), while roughly splitting Asians each time. The steady Hispanic growth will make the state very difficult for Republican presidential candidates unless they can regain at least some of the ground they have lost since Bush. Colorado: One reason for the improving Democratic performance among whites here is that the balance between those with and without a college degree has shifted even faster in Colorado than in most other Sunbelt states. Whites without a four-year college degree were 70 percent of eligible voters in 1980, but down to 53 percent in 2000 and only 44 percent in 2012. Over that period, college-educated white men rose from 11 to 17 percent of eligible voters, and college-educated white women advanced even more rapidly, jumping from 8 to 18 percent of eligible voters. In 1980, non-college whites represented over twice as much of the actual voter pool as the college whites; by 2012, the college whites (at 40 percent) nearly caught the non-college whites (at 44 percent). Nevada: The state has not seen as great an influx of college-educated whites as some other Sunbelt states. As the minority population has grown, non-college whites have dramatically receded: they represented 70 percent of actual voters in 1980, 60 percent in 2000, and just 43 percent in 2012. That decline has hurt Republicans who have carried about three-fifths of non-college white men, and narrow majorities of non-college white women, in each of the past four presidential elections here. College whites in Nevada have essentially held their ground: they were 20 percent of voters in 1980 and 24 percent in 2012, with the college-educated women providing all the growth. Democrats haven't run as well with those women here as elsewhere; in the four elections since 2000 only Obama in 2008 has carried them. But they have performed better among them than with other whites in each of the past three elections. Republicans have carried roughly three-fifths of the Nevada college white men in each election since 2000. Colorado: Married men and women were two-thirds of all eligible Colorado voters and nearly three-fourths of its actual voters in 1980. In 2012, they slipped to 56 percent of eligible and 59 percent of actual voters. Unmarried women increased their share of voters from 18 to 23 percent, while unmarried men, in contrast to other states, actually grew faster: they almost doubled from 10 percent of the vote in 1980 to 19 percent in 2012. Nevada: The state may be the nation's shrine to quickie marriages, but its own commitment to the institution is fraying as much as elsewhere. Married couples have skidded from 63 percent of eligible voters in 1980 to 48 percent by 2012 (although they still comprised a 55 percent majority of actual voters that year). Unmarried men and women are growing in the electorate at about an equal pace: combined they accounted for a majority (52 percent) of eligible voters in 2012, though only 45 percent of those who actually voted that year. 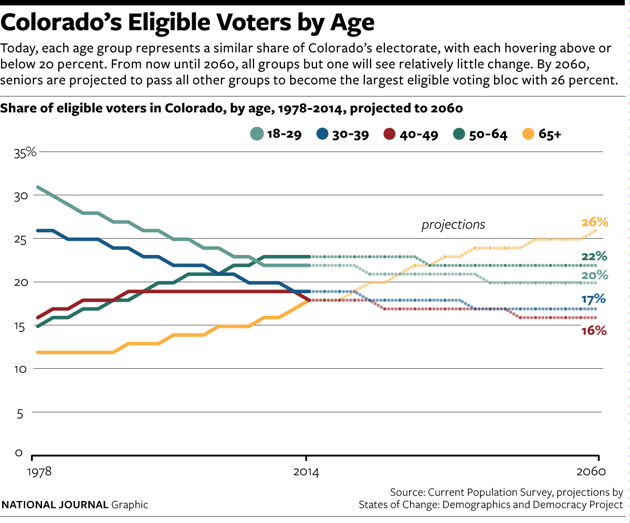 Colorado: The state is still younger than many others, but it is showing some wrinkles too. In 1980, voters under 40 represented 56 percent of eligible voters, while eligible voters over 50 equaled 27 percent. In 2012, the two groups converged at about two-fifths of the eligible voter pool each-and older voters raced past the younger cohort among actual voters on Election Day. The model projects older voters, especially those over 65, to continue expanding their influence. By 2020, it expects those over 50 to reach 42 percent of eligible voters, outnumbering the 40 percent under 30. As in other states, about four-fifths of Colorado residents 65 and older today are white-a challenge for Democrats, since they did not carry even two-fifths of Colorado white seniors in any presidential race from 1992 to 2008. (2012 figures by race were not available but Mitt Romney carried a solid 57 percent of all Colorado seniors that year.) While diversity is transforming the state's younger population, the model forecasts it will seep into the state's older ranks only slowly. Minorities already represent about one-third of the 18-29 eligible voter pool, and are projected to hit 42 percent by 2028. But the senior population will remain about three-fourths white even then, and will still exceed 70 percent through 2040, the model anticipates. 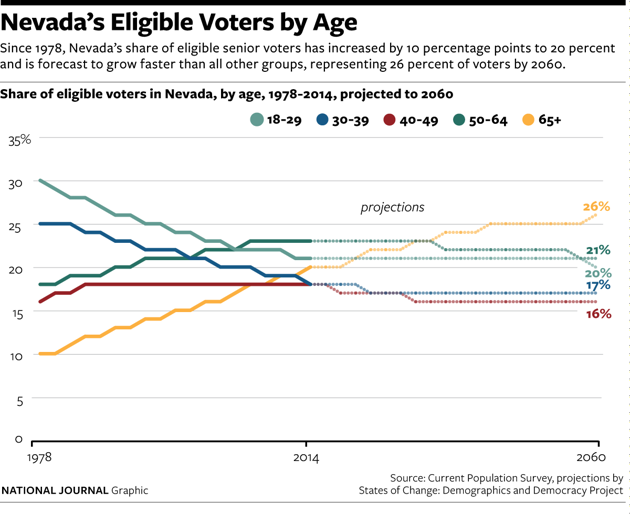 Nevada: The age trajectory here has followed a similar path but is forecast to largely stabilize in the decades ahead. Voters under 40 have slipped from 54 percent of eligible voters in 1980 to 40 percent in 2012. The model projects them to sink only slightly from that level to 38 percent in 2040. Voters 40-49 have held stable at about roughly one-sixth of the state population, and the model doesn't forecast much change for them looking ahead. But the population 50 and older has grown steadily, from 28 percent of eligible voters in 1980 to 42 percent in 2012. Within that, the biggest increase has come among adults 65 and older, who have nearly doubled from 10 percent of eligible voters then to 19 percent now. In 2012, the 50 and older population cast exactly half of all votes-up substantially from about two-fifths in 1980. The model expects a slight further increase in the share of eligible voters older than 65 to exactly one-fifth in 2016 and 2020. As the state's senior population grows, it will further widen what is already one of the nation's most glaring contrasts between "the brown and the gray." Minorities--the brown--already represent half of the state's eligible young adults from 18-29, but three-fourths of eligible seniors--the gray--are white. By 2020, the model projects minorities to reach 55 percent of the eligible young adult population while the senior cohort remains 71 percent white. 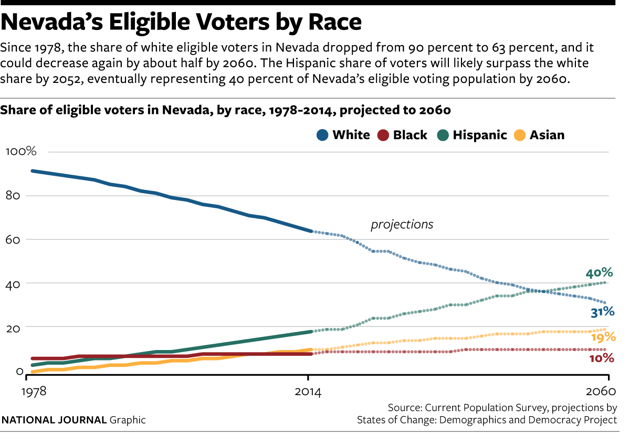 Even by 2040, when the model forecasts that 71 percent of Nevada's young adults will be non-white, nearly three-fifths of the state's seniors will still be white. The gap between the political priorities and preferences of those groups could be enormous: in 2012, Obama carried 68 percent of Nevada voters from 18-29 and just 44 percent over 65. Although figures by race weren't available for that year, that result virtually ensures he lost white seniors in 2012, which would continue a dramatic turnaround: while the Democrats carried most Nevada white seniors in the three elections from 1992-2000, Republicans won them in 2004 and 2008 (and likely 2012). In Nevada, as in many other places, the partisan divide increasingly also reflects an overlapping racial and generational divide.